Please forward these notes to anyone you think would be able to join us in this work of prayer and discernment. This may include other prayer networks or prophetic ministers with whom you are associated. I so appreciate some of you passing their newsletters to me as they help in this discernment process. In the last Discerning the Time, I named four demonic spirits which I believe are at work right now animating and strengthening strongholds and actively moving them to the next steps of fulfilling Satan’s purposes. These are: Gog, Moloch, the lawless one, and Amalek. I have received very strong confirmation from people about the names of these high-level demonic spirits. “A particular song kept coming to mind… that starts with the lines, “There’s a wind a-blowin….” Immediately I was confronted by the image of tornadoes and then, strangely enough I found myself in a boat on a body of water… and Jesus was there outside the boat… and he was saying “Come!” and motioning to me to join Him outside the boat on the water. I was terrified. This is right. Stop and ask now, “Lord, are you calling me to intercede? 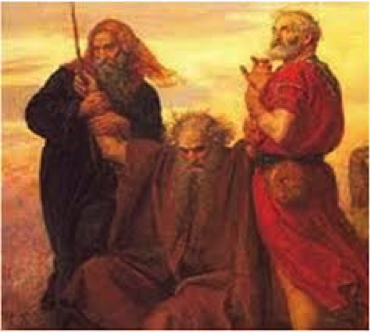 How are you calling me to engage?” As you ask this question consider the different types of intercessors represented in the picture of Moses being supported by Aaron and Hur. Go into the Moses work of actually getting out of the boat, of stepping into the gap, only if Jesus calls and empowers you. Others may be called, like Aaron, to support those involved in this intercession work. Still others may be more like Hur, called to take the long view, grasp what is happening on the battlefield and the movements of the Holy Spirit as well as those of the devil. If the Lord is calling you (and I certainly hope He is calling at least a few of you into this!) then please keep reading. Vision Guidance from Bernie: Gog, Moloch and the tornado-like tentacles of Leviathan. 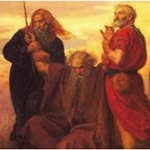 As you ponder this discernment of the four Archons (demonic powers) that are working – Gog, Moloch, the lawless one, and Amalek, which ones do you get a reaction to? That may be a way that the Holy Spirit is giving guidance as to what particular areas you are being called to engage with Jesus. If you have a strong reaction you could actually be touching the fringes of the demonic stronghold itself which is another way the Holy Spirit gives us discernment. For me, I am reacting to all four! I am also finding what Bernie said about the strong reactions to Moloch and Gog is most confirming – they seem to be dominate right now. I have also been having images of those “tornado-like tentacles.” This vision of black tornados was given back when Osama Ben Laden was killed. Intercessors saw these as Satan looking for new people and means for expressing his purposes that had been embodied in Osama Ben Laden, the one around whom the demonic stronghold had effectively formed. It seems obvious that one place where they have landed and taken root is in the on-going conflict in Syria and in ISIS which is on a rampage of death, killing other Muslims, Christians, Americans, anyone in their path. This is forming into a stronghold of terrible power that unless stopped is gaining more and more the means to accomplish its deadly purposes. Thank God for the recent engagement of American forces aiding the Iraqis and the Kurds in this battle. We need to pray for President Obama and the Democrat-controlled Senate in this whole crisis. There seems to be a deep blindness not just to spiritual reality, but to geopolitical realities of the activity of evil that is indeed part of the 21st century. Fallen, sinful human nature has not been fully redeemed nor have the works of the Devil been fully destroyed, and the active working of the Devil in the world has unfortunately not ceased in the 21st century. This blindness comes from a “liberal progressive worldview” as well as the deliberate cloaking by Satan of the true aims of the present strongholds he is so effectively building. 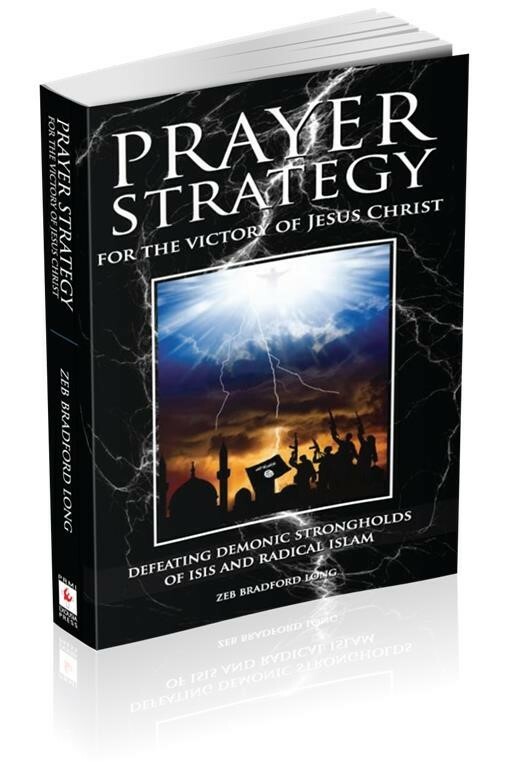 More on the nature of the demonic stronghold of the ISIS or the Islamic Nation later, but given all this, how is the Holy Spirit calling us to pray? Another intercessor in Canada (I am not sure why but I keep getting guidance from Canadians more than from anywhere else.) received very specific guidance that may be giving direction both in praying about ISIS but also concerning the ongoing battle between Hamas and Israel. This intercessor has requested that his name be withheld. His guidance is presented largely unedited for your discernment, it is unusual although not without precedent in the Scriptures. Please just pray through these and ask the Holy Spirit to reveal to you whether they are to provide promptings for your prayer. Also, always send along any discernment that you may receive. Especially let me know if any of these points resonate with how the Holy Spirit is calling you to pray. a. That IDF go into Gaza and [win the victory] over Hamas. c. That God send a mighty earthquake to Iran to destroy irreparably the critical N-site of Quds, and its vast nearby missile bed, and also what is left of Qom. a. For him to recognize the need for war and to be utterly resolved that Israel will fight. b. Remove all fear of America. Disentangle him and fill his heart with one purpose. c. Lord, help him to remember what You have just done for Israel during round one with Hamas. d. Let him not worry about the cost of the battle ahead, but let him place his entire trust in You, Lord. e. Let the Word of God dwell in him richly and let him pay attention to it. f. Cause his eyes to be opened, so that he may see that those who are for Israel are much more numerous and far stronger than those against her. g. Enlighten his eyes, Lord. Remove any darkness there. Let him see as the leader of Your people ought to see. THE ENEMY IS TRYING TO STEAL FROM GOD WHAT IS GOD’S ALONE.. This plays out through the Islamic bad guys, NWO plans and hidden agenda, rising anti-Semitism, Hard Left, etc. All of these areas mark the battlegrounds between God’s agenda and that of the enemy. 6. 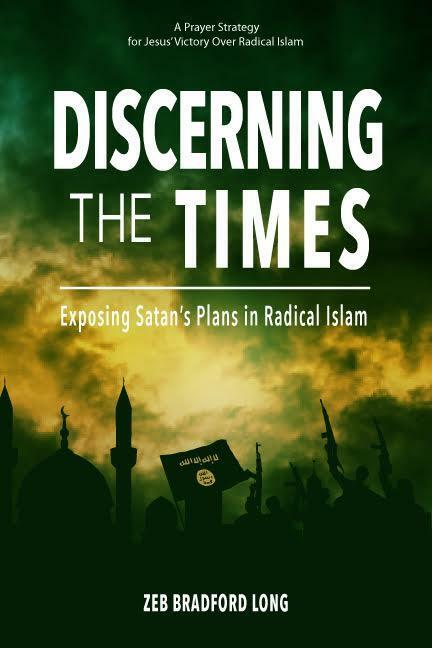 Lastly, I have been informed that ” a time of intense prayer is coming “, which I believe means the main phase of the Psalm 83 war, when ISIS, Hezbollah, et al attack Israel in earnest, is not far off. Please pass on any guidance. It seems to me that there is truly a time of intense prayer coming and indeed is already upon us, which is why you are getting these Discerning the Times as fast as I can get them out! We as intercessors must step into the gap and be led by the Holy Spirit as to how to pray, but as noted above by Bernie, only as led by the Jesus Christ. When Netanyahu was PM the first time, we heard an elderly man, give a prophetic message that said when Netanyahu was assassinated all hell would beak loose in the Middle East. I am asking God to keep Netanyahu safe from the enemy and his plans. PS- please don’t publish my name either. I was called into prayer (reluctantly) this morning and was led to ask the Lord to show me where I was called to intercede, taking note of Bernie’s caution, I was led to pray for the Lord to raise up multitudes of Aaron and Hur, intercessors of perseverance to hold up the arms of those who are called into the role of Moses, I then felt the Lord encourage me to pray for people to step into the role of David, the giant killer, as we need people who are armed with the specific ‘stone’ to kill goliath. I am not implying that there is a stronghold goliath, it is more a sense that the ‘stone’ is the key – I myself don’t even know what this means but you asked for any discernment so I’m sending it out of obedience but I can’t offer anything more on this point. I was also led to a passage in revelation 15: 4 – 6 but particularly vs 6 “I saw that the woman was drunk with the blood of the saints, the blood of those who bore testimony to Jesus” I think her name is Babylon and this name and image made me feel dreadfully sick. I saw the image and her revelling in the blood of Christians and becoming more and more drunk and the more drunk she became, the more insatiable her appetite and the more depraved were her actions. I thought about the 4 archons you mentioned and they all seem very ‘masculine’ but this one is a very powerful… I don’t know what to call it… but is there something about it being feminine and the power that has over man? I don’t want to pray into this image at all, but I do want to share it. I have no interpretation and only a fleeting thought “is Babylon controlling the 4 archons?” it could also be the other way around, the actions of the archons are feeding her blood thirst, or it could be a red herring. I pray strength, wisdom and revelation into your life as you stand and resist. As I listened to the LORD over the names you put forward, the one word I keep getting is simply, ‘anarchy’. It is encompassed in all four you have named, and it encompasses all four. I have held back, because it seems redundant, and yet I put it forward to you, because it is what I am hearing. The other thing that seems important to me is a word I received some few years ago, but which seems particularly relevant to what you are saying now about different roles of intercessors. That word is, ‘scouting behind enemy lines’. I had a picture of an old fashioned war room, or command centre, with intelligence being fed in and strategists giving orders to move troops into place as the battle progressed. I don’t know that this adds anything to the picture you already have, but I offer it anyway. I have recently felt led to pray particularly that those God has given to Jesus will have their eyes opened and turn to Him, so that the curtains can open on the final act, and I do sense a great ‘agreement’ with the reference to Satan changing the times. We must pray for God’s timing and that Satan will not push to the end before all is ready. Brad; These words that I have just read took me back a year ago when the enemy struck 2 panels of copper roofing on our church with a tornado looking cloud when it was a totally blue sky. The cloud came down, touched the grass out front of the church, went back into the cloud and came down and twisted those two copper panels for scrap. Then it turned and went towards the CE director who was in her car. After that it went straight up into the cloud and was gone. I had been praying outside the church for 40 days about a Muslim couple who were praying on our property but beat it at the name of Jesus. That was last year. This was last night. I dreamed about a war on American soil where we had to fight Muslims and other Americans only last night. I found myself calling out for people to pray instead of using weapons. Then the enemy stepped in and urged us to use weapons against each other. But God clearly told me to pray. Satan attacked me at the VA and messed up my 9th rib on the left side. It is healing.. I have been praying for the middle East on a daily basis.What has just come to me is. Hordes of people moving on the church,these people are Christians and they are blind to the fact that on their backs are demons hitchin a ride as an advancng party to cause disruption and confusion.This advance party is paving the way for the battle of evil that is yet to come.The advance party of evil is to weaken the resolve of the church so that it will be too weak to make a stand. This disturbes me greatly Brad as I feel we in the church are too weak in our prayer life to make such a stand.